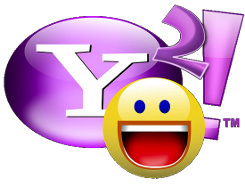 Looking for Yahoo Messenger 6 contacts to talk to? Reply to this topic with your Yahoo Messenger name and others can add you to their contact lists! You may want to add your location, timezone, spoken languages, or other details that might be helpful. will be this compatible with jabber? Right now, Wildman’s Yahoo! server only supports the YMSG protocol. I’m not exactly sure about him supporting XMPP as an alternate protocol yet, but it’s highly unlikely.